Habit: Annual, unarmed. Stem: spreading radially, prostrate to ascending, < 1 m. Leaf: even-1-pinnate; stipules narrow, green. Inflorescence: flowers 1 in axils. Flower: sepals persistent or not; petals yellow to orange, persistent, withering. Fruit: 10-lobed, splitting into 10 tubercled nutlets; style persistent; pedicel reflexed. Seed: 1 per chamber. Stem: prostrate to decumbent, < 0.7 m, strigose to glabrous. Leaf: stipules 1.5--5 mm; leaflets 6--12. Flower: pedicel generally < to +- = subtending leaf; sepals spreading, deciduous; petals 3--5 mm, yellow. Fruit: 3--5 mm wide, ovoid; style < body. Unabridged Note: "Last collected in California in 1948" (TJM (1993), p. 1099) no longer true. 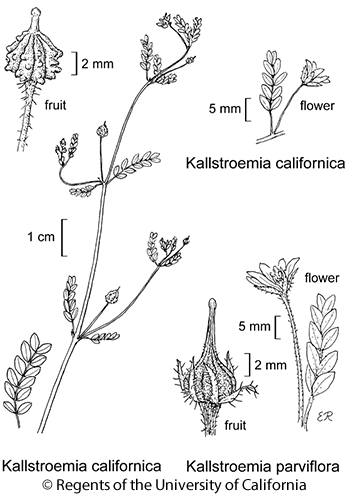 Citation for this treatment: Duncan M. Porter 2012, Kallstroemia californica, in Jepson Flora Project (eds.) Jepson eFlora, http://ucjeps.berkeley.edu/eflora/eflora_display.php?tid=29857, accessed on April 25, 2019.